Clinical appearances are variable; the tumour is usually seen on the dorsum of the tongue. Adults between the ages of 30-60 years are affected. • granular cells replacing muscle fibres (Figs 218 & 219). The epithelium may closely resemble carcinoma but lacks ccllular atypia. Cells with coarse eosinophilic granules appear to merge with muscle fibres. Positive staining for S-100 protein and neurone specific enolasc suggest a neural origin. Treatment Complete excision is curative. This soft, rounded swelling may rarely be found on the alveolar ridge of neonates. The upper jaw is usually affected and most arc in female infants. Microscopy Close-packed granular cells have prominent cell membranes. 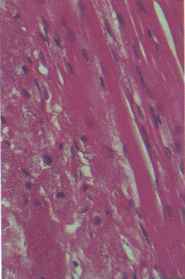 The granular cells stain with myogenic markers (e.g. myosin and actin) but not for S-100 protein; they are probably of mesenchymal origin. 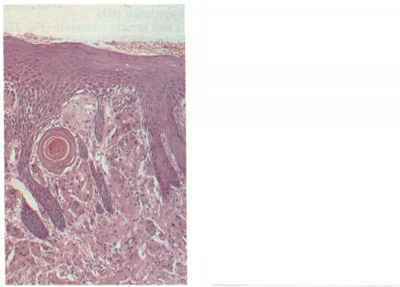 The surrounding epithelium is flat and lacks pseudoepithelioma's hyperplasia. fig. 217 Granular cell tumour: pseudo-epitheliomatous hyperplasia. fig 218 Granular cell tumour: pseudoepitheliomatous hyperplasia with cell nest and granular tumour cells beneath. fig. 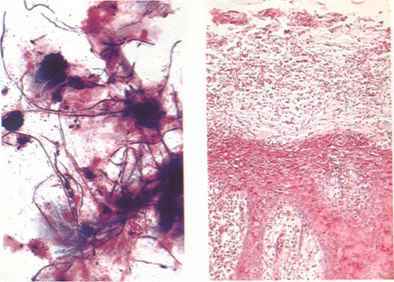 219 Granular cd tumour: granular tumour cells merging with muscle fibres.